China aims to send the Chang'e-4 lunar probe to land in the south pole region of the far side of the moon in 2018, according to China National Space Administration (CNSA). Scientists plan to send a relay satellite for Chang'e-4 to the halo orbit of the Earth-Moon Lagrange Point L2 in late May or early June 2018, and then launch the Chang'e-4 lunar lander and rover to the Aitken Basin of the south pole region about half a year later, said Liu Tongjie, deputy director of the CNSA's Lunar Exploration and Space Program Center. "We plan to land Chang'e-4 at the Aitken Basin because the region is believed to be a place with great scientific research potential," Liu told Xinhua in an exclusive interview. With its special environment and complex geological history, the far side of the moon is a hot spot for scientific and space exploration. However, landing and roving there requires the relay satellite to transmit signals. 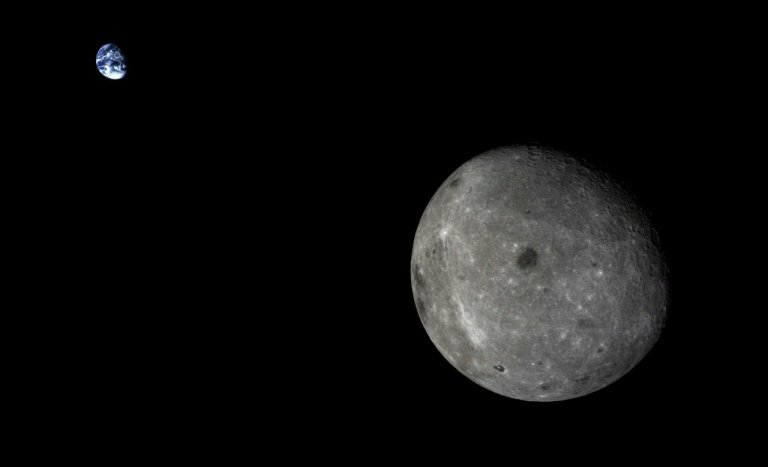 The transmission channel is limited, and the landscape is rugged, so the Chang'e-4 mission will be more complicated than Chang'e-3, China's first soft landing mission on the moon, which was completed in 2013, said Liu. The lander of Chang'e-4 will be equipped with descent and terrain cameras, and the rover will be equipped with a panoramic camera, he said. Like China's first lunar rover Yutu, or Jade Rabbit, carried by Chang'e-3, the rover of Chang'e-4 will carry subsurface penetrating radar to detect the near surface structure of the moon, and an infrared spectrometer to analyze the chemical composition of lunar samples. The Chang'e-4 probe will also carry three scientific payloads respectively developed by the Netherlands, Sweden and Germany, according to Liu. "The Chinese and Dutch low-frequency radio spectrometers on the lander and relay satellite of Chang'e-4 might help us detect the 21-cm hydrogen line radiation and study how the earliest stars were ignited and how our cosmos emerged from darkness after the Big Bang," said Chen Xuelei, an astronomer with the National Astronomical Observatories of the Chinese Academy of Sciences. The Chinese public, especially young people, are encouraged to participate in the Chang'e-4 mission. The CNSA launched a contest among students across China at the beginning of this year, collecting creative ideas on the design of the payloads on the lander, rover and relay satellite. "We received a total of 257 submissions, and 20 items entered the primary selection. The final result will be announced in September after online voting and expert evaluation," Liu said. According to the website of the CNSA's Lunar and Deep Space Exploration, entries including a micro-ecological circulation system, a deep lunar soil temperature detector, a 3D printing technology using lunar soil and a sound transmission experiment device have proved to be the most popular in online voting.